In honor of #smallbizsat coming up this Saturday, November 25th, we decided to highlight 3 of our favorite small businesses. Where do you shop small? We’d love to hear who you support! We’re giving you the tea on...tea! Brooklyn Tea seeks to create an authentic and accessible escape for its customers through luxurious teas. The teas are of the highest quality, organic and fair trade whenever available. We were introduced to one of Brooklyn Tea’s cofounders through a mutual friend who told us Jamila was an Atlanta native who moved to New York and started a business (sound familiar?) We can’t wait to see Jamila and her cofounder, Ali Wright, flourish. Emily Ellison takes flower power to a new level. This New York City trained floral and event designer has done it all from weddings to private events to commercial installations. She is one of our favorite small business owners because she brings grace, beauty, and inspiration to all of her projects. And plus, who doesn’t love flowers?! Diversity and creativity mean so much to us, which is why we value the work Darnae is doing at Me-Charis. 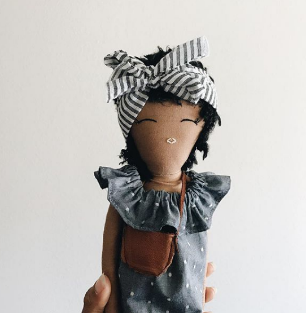 Darnae creates handmade dolls with various complexions and shows girls everywhere that they belong. We believe that all children should see themselves in the world and feel empowered and proud of who they are. Thank you Darnae for your authentic work and for reinforcing the idea that everyone should be represented.